According to Magento customer and market share report, the popular Content Management System (CMS), currently powers 842,618 websites. Wow, that’s a huge number. If you own an ecommerce store, or you are thinking to setup an ecommerce store, Magento should be your first choice CMS for setting up an ecommerce platform. To begin with, we will first host Magento on Amazon Web Service (AWS) platform. You might ask why am I considering AWS to host my site when Google is also available? Because AWS hosts the world’s number one ecommerce store Amazon. Let’s begin with Magento AWS hosting. Select a machine with default operating system (OS), such as Linux, Ubuntu, or Windows etc. Select the Ubuntu server. 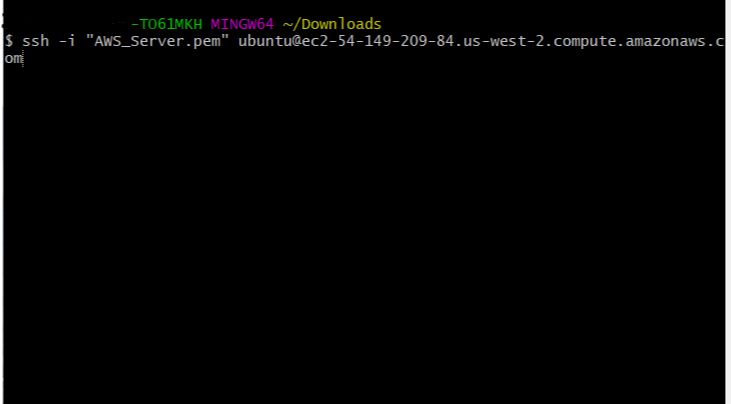 Most developers tend to use Linux operating system to carry out their tasks, therefore I prefer Ubuntu. If you are a Windows user, and you want to select a Windows operating system, you are more welcome to do so. The configuration is almost identical. You can configure your machine (i.e. instance). Since, there is nothing much to do, proceed ahead with add storage. Now, the system will ask you to add storage. By default, the storage size is enough, but if you want to increase, then just increase the size. Once you complete the process, it time to click on Add Tags. For now, we don’t need any tags, therefore, click on configure security group button. This is important. Click review and launch. Then you will have the opportunity to review your configuration again. Click Launch. You will see the following prompt. Here, instead of choosing an existing key pair, select a new key pair and give it a name. You might be wondering what is a key pair? In simple words, its a key which lets you connect to your server machine securely. 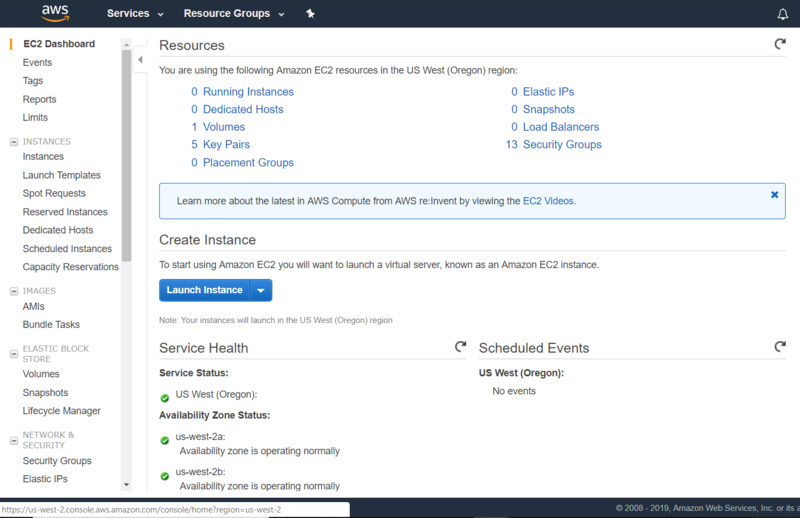 It consists of a public key that AWS stores, and a private key file that you store. Together, they allow you to connect to your instance securely. For Windows AMIs, you must use the private key file to obtain the login password for your instance. 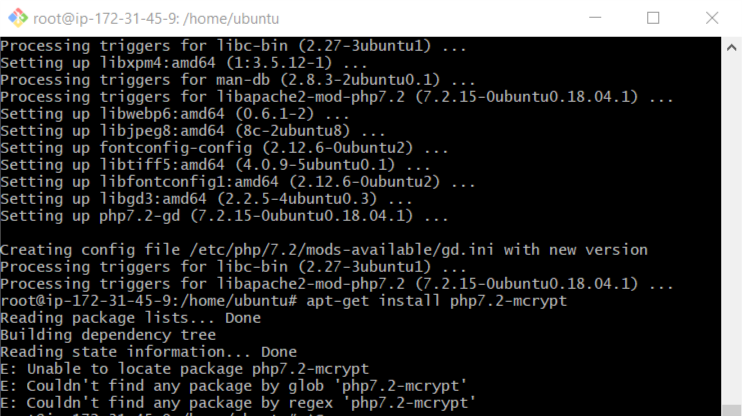 For Linux AMIs, the private key file allows you to login to your instance with active SSH. Download the key pair and keep it secure, as without it, you won’t be able to access your server. Now click on launch instance. A new screen will open up. Now that you know about how to connect to your new server, we will opt the easy way. Remember the key pair you downloaded earlier? Navigate to that folder. Assuming, you have git installed, right click in empty space and select git bash here option. Now copy the line, I underline just below the example which starts with ssh -I ……. Press Enter. You will get a question: Are you sure you want to connect? Enter yes. Congrats, now you are on your server. But we must fulfill the requirement to make Magento work. Therefore, it is time to set up a PHP environment. Next, we will run a few commands on git to install the prerequisite tools. 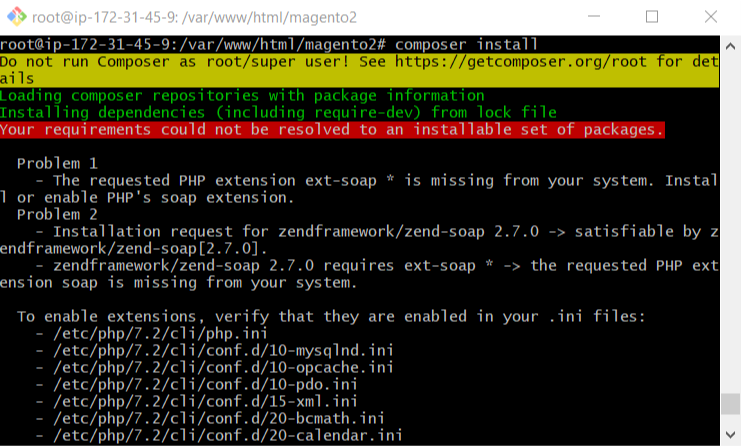 You will have to execute the following code on the terminal to get the required tools for Magento installation on your server. This will show all the directories on the server. This will direct you to the home/ubuntu directory. It means that you have logged in as a root user. This will update your server with the latest tools. This code will install Apache (a web server software), PHP (latest version, currently its 7.2) along with necessary extra tools required for Magento, and MySQL server which will serve as a database. Press Y if asked do you want to continue? Once the installation is complete, you must create a database. Press ctrl+x, press y and hit Enter. Otherwise, php extension will be missing. It will ask you a password. By default it’s none, so just press Enter. Now you are in MySQL terminal. show databases: shows you current table. You will see the following screen. It means you are all set to setup your Magento on AWS. The above message indicated that you have successfully installed Magento on AWS. 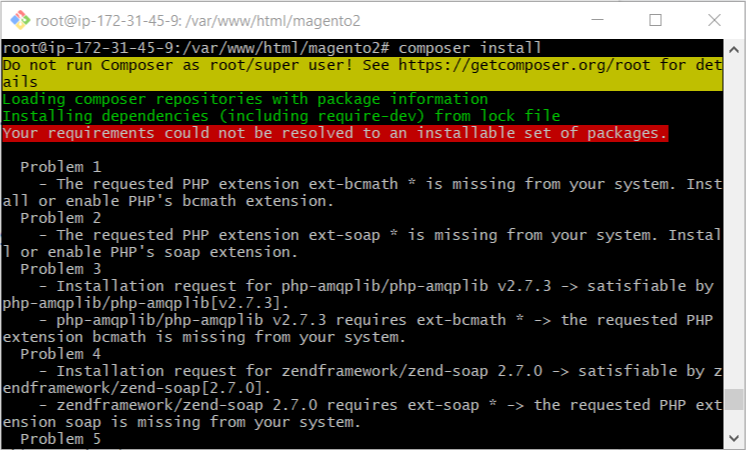 For now, you have spent ample time just to set up your Magento server. 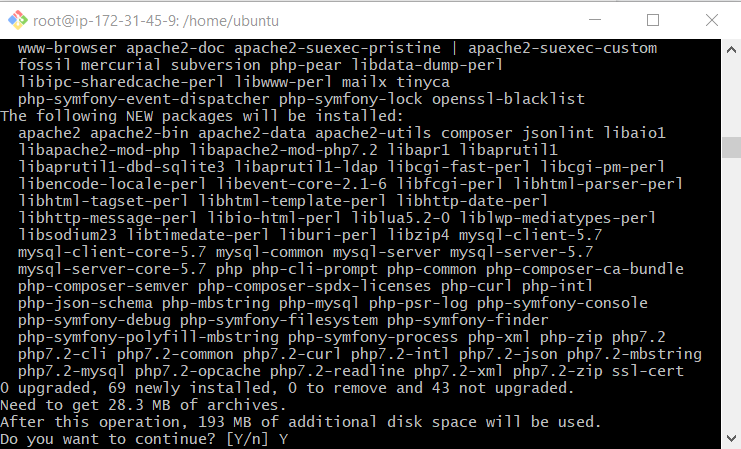 With every update rolling out for PHP or MySQL, there is no denying the fact that sometime you may face error(s) while setting up the environment. In the future, if Magento rolls out any new update, you will have to update the server. You might think huh, that’s easy! Well, don’t deny the fact that there will be risk involved with your Magento application behaving abnormally, or there might be data loss. For now, we have taken a simple, easy path to set up Magento on AWS server. Right.. But the journey doesn’t end here. There was no talk to secure your server or your site. There was no steps or methods defined to make your site load faster or optimize the performance of your website. Is it my fault that I did not discussed that? Nope, I can but then it wont look like an article but rather would look a book chapter. Therefore, instead of going through all the hassle of setting up the server and managing it when it comes to security, performance and reliability, you should choose Cloudways Managed Magento Hosting. WHY? Here are the reasons. Cloudways provides multiple cloud platforms such as AWS, Google Cloud, and DO. Moreover, it enables you to deploy your Magento store in more than 40 locations across the globe. The platform has the power of ThunderStack, that makes your Magento store lightening fast. The technology stack brings together the best of Apache and Nginx, along with Varnish, Memcached, and optional Redis. It ensures that your Magento website remains up and running in terms of performance, speed, and user experience. With Cloudways hosting, you can manage your cloud servers and applications conveniently. Thanks to the easy-to-use, feature-rich console. You can carry out multiple tasks with just a few clicks, making the deployment process considerably quick and easy. You can launch a server, point a URL, install an SSL certificate, or clone your store with this one-click feature. Another amazing feature of Cloudways is auto-scalability – the ability to scale the resources whenever there is a need. It is easy to meet the hardware requirements of the ecommerce store with this platform, as you simply need to select the server size and deploy it. Being a managed hosting platform, Cloudways provides unmatched security for your Magento store. It follows a multi-layered security approach, with fully- integrated Let’s Encrypt certificate authority and regular security updates. Another feature that works in favor of this platform is its cost-effectiveness. Not only has a reasonable price tag, but also follows the pay-as-you-go model. The users only have to pay for the resources they consume. Seamless, round the clock, tech support comes as the additional advantage of having your Magento store run on Cloudways. Technical support is available 24×7 with Live Chat and Ticketing system. 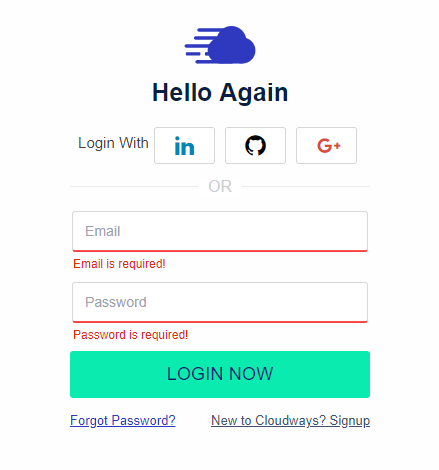 First, create an account on Cloudways. Once you have the account setup, launch your server on the platform. 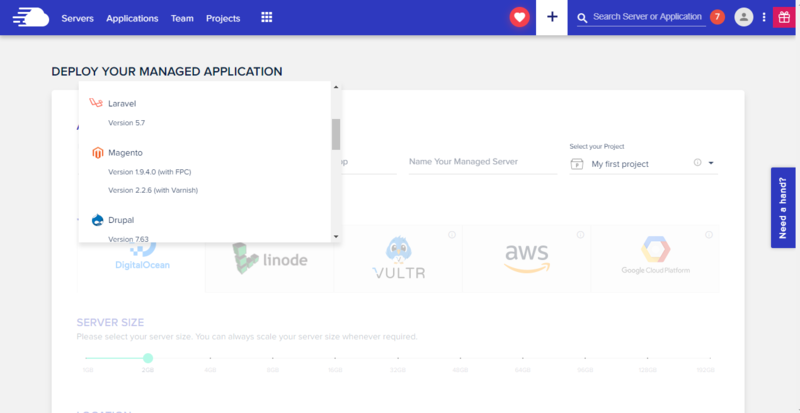 The best part about using Cloudways is that you get to choose from five different cloud hosting providers including AWS, Google Cloud, DigitalOcean, Linode, and Vultr. Click Add server for AWS Magento. You can easily create a server within seconds with the point and click dashboard. Next, select the location of the server that you want to launch. That’s it. Ready to host your Magento store on Cloudways? Cloudways is offering FREE $25 hosting credit on using Coupon Code: MGT25. 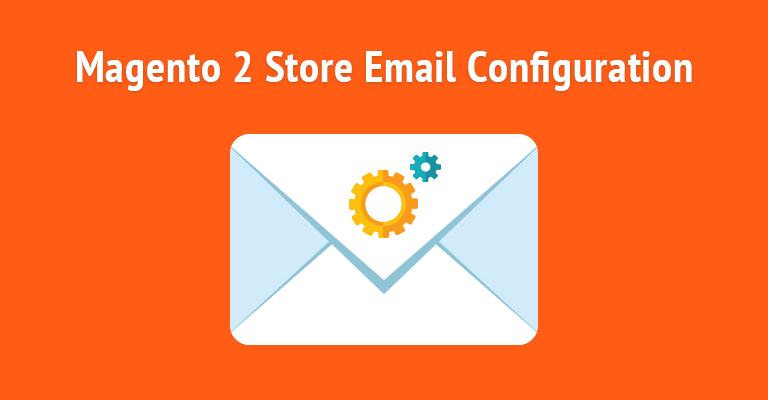 That’s the beauty of using a managed cloud hosting solution for your Magento ecommerce store. No errors. No time wastage. No hassle. And, most importantly… no stress. 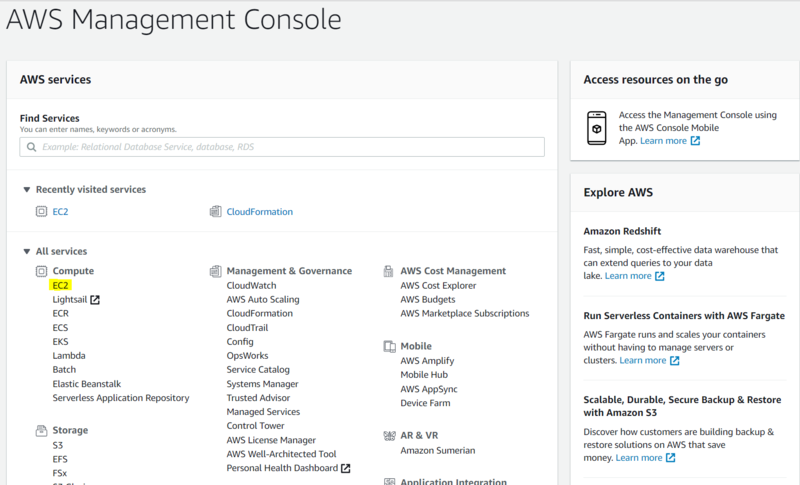 With just a few clicks, you can successfully install Magento on AWS infrastructure. You know what? The AWS Magento hosting simply gets easier with Cloudways.